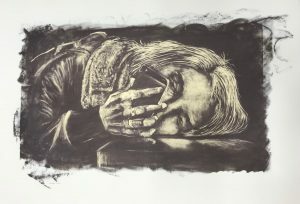 The Drawn Portrait in Contemporary Printmaking: A journey between analogue and digital. An early reflection: I WANT TO SAY…………. At the beginning of my research I want to say that drawing is a personal activity that makes the world appear on paper. I want to say the world is seen through one’s eyes and one’s view is unique, it cannot be repeated, cognitively or philosophically. Two perceptual experiences cannot be identical. We know this through DNA research into identical twins by Professor Eric Kandel (1) who shows that although the two may be identical and brought up together they will experience the world differently. I want to say that one’s interpretation of what one sees is subjective. I.e. It’s determined by one’s views, experiences and accumulated knowledge. Therefore the drawn image may be a manifestation of the world, but it is also an interpretation of that world. It is an artefact that exists in the world. It could be a drawing of an inanimate object, a building, bike, landscape or ….. another human being. I want to say this last subject of the drawing artist is more complex and open to interpretation than the previous inanimate subjects. I want to say that once one embarks on making an image or interpretation of a human being it may become a portrait of that person and capture something of them, unknown to both subject and maker, but may become known to both and others. I want to say that although I understand what a portrait is in well established and recognised traditions of art and thought, I must challenge that word and what it might mean in contemporary terms. I want to say that these statements are true, but I may have to prove that in the long term. This is my practice led research. Now a little more considered review of where my early research is. I am working out how much my practice led research PhD thesis can be practise and how much is academic research. This is important to me as I can plan and divide my time accordingly. It also is a question that I need to answer to justify the work in terms of artistic practice, my personal artistic development in the coalition of drawing, digital photography and printmaking. I further intend to interrogate the work in an academic context whereby I test if my investigation and methods can constitute a new contribution to knowledge in the field. What have other artists contributed currently and in the past? What has been written before about these three areas? I am being given pointers on the latter and my eye’s are being widened to ‘take in’ additional styles, approaches and processes of drawing to take me out of my ‘safe’ drawing methods and encourage me to explore and improve artistically in the journey to develop a unique methodology. I am also looking to make material investigations into the process of silk screen printmaking to enable me to predict, from an informed standpoint, outcomes from my drawing and it’s transfer to paper via this print medium. These two areas have come together recently in a shifting of my thinking when my drawing experiments, encouraged by Dr Catherine Baker, have thrown up a technique of rubbing carbon into paper thereby creating a dark ground for drawing with an eraser. i.e. Light out of Dark. In tandem a discussion with my master printmaker colleague Justin Sanders, suggested I might follow one of his experiments : ‘silkscreen mezzotints.’ A term I have never heard of, but it is intriguing to put together two seemingly very alternate approaches that differ in scale, mark making and with a nod to different times and print-making traditions. This is an illuminating moment where two print media could be aligned to make a third. One could create a dark ground and draw with a burnisher that is usually used to draw, scratch and soften metal to create highlights. Using an eraser to ‘draw’ on a dark ground made on a sheet of mark resist film (2) achieves a similar light out of dark effect. The resultant positive could then be exposed on to a silk screen to be used to print on to selected paper. There would be no raised border that a mezzotint plate would create having been run through a pressure printing press, but there may be other artistic benefits – size, textures, retained print detail over large editions. A border could be made, printed or even embossed. I want to say that throughout my early reserach l have found it necessary to identify a term that has helped me ‘anchor’ points on my journey. The ‘silkscreen mezzotint’ will not be new, as my colleague has experimented with it, however it is ‘newtome’: a new descriptor of many of my experiences in these early research days. Newtome are the realisations that my research is throwing up on a regular basis. Whether it is in the application, selection and reframing of digital photography; techniques, processes and making drawing; and the similar gamut of past and present printmaking media that can be tried and tested, no matter how unknown they are to me with my limited contemporary artistic breadth of experience and vocabulary. This self same analysis can be applied to my academic writing, as I write, however I will stay with the ‘artistic practice’ element of my research at this juncture. I want to say this ‘Newtome’ silkscreen mezzotint is motivating me to work through a selection of photographic images that could benefit from a large scale, dark ground, burnished image and embark on making a new ‘eraser drawn’ silk screen printed portrait. Perhaps not quite a silk ‘screen mezzotint’ but certainly a unique method of digital and analogue image making. It was beyond gratifying to read this exposition of the rationale for drawing is still relevant today 700 years on, when the word of God is perhaps less prevalent. I have made a number of detailed notes on Cellini’s technical instructions to the learned drawing artist, which I can foresee bringing newtome methods to my practice. However before returning to the drawing board, another ecclesiastical coincidence appeared. When asked the question by Elena Cue for the Huffington post in 2016 (4): Do you feel that you have a body or that you are a body? As Saville states : ‘God has been slipping away for many of us’. She then alludes to there being a third party involved, ‘God or whatever’, which relates back to Cennini’s contextualisation of making art in the eyes of God. I point to this not simply because of the coincidence of the strands of research and thinking coming together at one precise moment, but because it brings another authority for the work and the/a reason for using ‘skill of hand to fix with the hand, presenting to plain sight what does not actually exist’. Like Saville, God has slipped away from me to some extent over the years. That said I have been considering the ethics of portraiture and the figurative representation of human beings in a variety of Cultures as well as that of contemporary British Culture. ‘Consider the notion that taking a photograph of a person “steals his or her soul.” For most of us in developed countries, this idea seems like a pre-technological fear born of simple ignorance of photography. It’s an easy concept to dismiss, as it seems so simplistic and overtly fallacious. But I claim there is value in actually considering this notion more carefully, because it functions to exercise our critical thinking skills, and it demonstrates that there is often a great deal going on with an extraordinary claim if we simply think about it carefully. ‘I am often asked : “Aren’t pictures of living things banned in Islam? Looking around the museum galleries, and indeed at almost any collection of Islamic art, the simple answer is clear – no. Poets peer out from illustrated manuscripts; languid aristocrats are woven into silk panels; mounted falconers chase their quarry across ceramics, metalwork, and carved stone. It is undeniable that from the earliest period until the present day, figural representation has played an important role in the arts of the Islamic world. Without cognisance of the possible ‘theft of the soul’ some contemporary users would rather avoid consuming social media images and look forward to meet other people in face to face exchanges, whether in intellectual, social and daily transactions such as seeking directions from another human being, rather than praying to the smart phone’ google map. “Yes, I want to quit all the time. I’m fed up with Instagram and Facebook. I’m fed up with myself subconsciously comparing my life to those of others. I’m fed up with feeling jealous that my friend has so much more fame/money/success (with school, life, dating, etc.) than I do. Why isn’t my life as exciting as ______’s? I don’t party as much or travel as much or do ______ (insert interesting activity here) as much. Damn, is my life boring? These are contemporary, multi cultural, ethical questions that pertain to my work as I attempt to ‘fix’ the subjects of my considered methods of digital smart phone photography, hand drawn and printed portraiture on paper, to be exhibited in art environments. I am looking to read and research further on the experience, motivations and ethics of discreet portrait sourcing through the medium. I want to say that these social and ethical questions of digital and analogue experience need to be asked in the context of my drawn portrait research. They may seem to be beyond the physical and artistic acts of creating drawn and printed images, but I think not. Gaining an understanding of the societal positioning of portraiture is important to inform my developing practice. However, I want to say in order to do justice to the making of a portrait of another person one must spend time and energy developing the range of artistic skills and methods necessary to make informed choices and judgments on how one can represent someone. What paper, what tools, what background, what shading, what technology, what materials can be used in making any particular drawing or print. When embarking on a drawing these questions are asked. One hopes to make the right choices, but one may not, but one will learn from those decisions and become more knowledgable of one’s developing methodology. When beginning to make a print of a drawing, because one wants to transfer the single drawn picture to a reproducible medium with its own characteristics, one has to draw on learned experience of working in that medium. One is focused on the technical expertise, methods and parameters of the medium that if not performed well will not produce a satisfactory image. Tablet drawing, digital pencils and software applications are genuinely 21st digital tools that I am regularly drawn to as I enjoy experimenting with the process from smart phone photography to tablet drawing, layer upon layer, brush by brush to be printed out on high quality inkjet printers on quality paper. This process although enjoyable raises questions about ‘copying’ rather than drawing; digital rather than analogue, technical rather than artistic, from eye through the hand to a screen. I can enjoy creating a portrait through drawing digitally on a tablet, and it’s not easy! It has its own characteristics that I am becoming more proficient in. It is as time and attention consuming as an analogue drawing. I want to say that during my practice led research I sometimes feel I should not ‘make’ digital drawings because the process is so electronic and so far from the tactile drawing, materiality of surface response and printmaking skills that I use to create unique printed portraits. Tablet digital mark making is constrained to the tablet size and the hand cannot draw expansively, even through the image can be expanded during drawing. Drawing at scale with tactile tools on paper surfaces the drawing hand, and arm, can be less constrained and more expressive. This physicality of drawing at scale is enhanced as one tends to stand to draw at scale, the opposite is true of drawing digitally where one tends to sit. Digital, tablet and haptic methods may distract or contradict the tactile analogue methods of seeing and drawing I am engaged with. Kentridge affirms the ‘labour’ of drawing ‘to make visible the hours on paper’. This resonates with Cennini’s assertion the drawing ois a labour of the hand. It also chimes with my practice and increasing desire to show/reference the physical elements of the making in the artefacts, no matter the medium being utilised. Drawing, photography or print. I am reflecting on contradictions of my methods of making images on paper, in the digital and analogue realms, with the knowledge and experience that I can make a portrait from beginning to end in a closed digital loop, yet produce a limited edition bespoke printed output on quality paper to be proud of sharing and exhibiting. 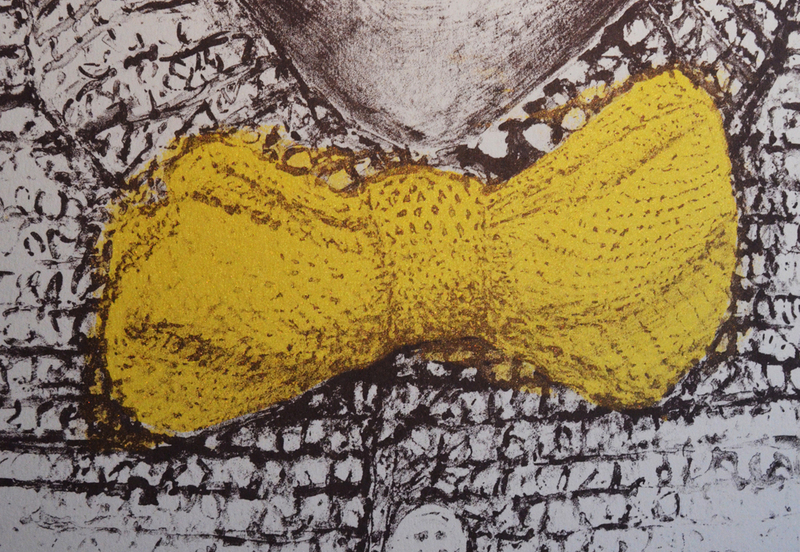 In fact I have just had a small inkjet print accepted into the Printmaker’s Council exhibition made in this way. 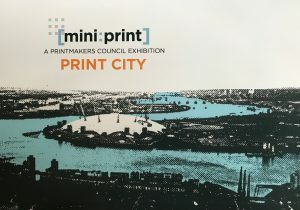 The adjudicator of the exhibition, on viewing my submission wrote to me requesting an explanation of the process I undertook as they wanted me ‘To explain your working method in making your prints as we want to make sure that they are original prints’. I respected these queries as meeting the criteria for this exhibition is important as the prints will become a part of the V&A Print collection and thereby enshrined in print history. Having reviewed this text over the last weeks to respond to the advice from my research supervisors I have in parallel carried out the practice element of my research. In pursuing the ‘Newtome’ potential of the ‘silkscreen mezzotint’ I selected a smart phone photograph of a woman staring intently into her smart phone in an arts centre cafe. Her concentration was complimented by her resting head on the cafe table, her hand steadying the phone, her woven scarf and dark leather jacket. Although lit from the window to her left, I could imagine how I might darken the background using the carbon rubbed into the film approach, and how the subject might be drawn into the ground with a series of shaped erasers. Taking this approach to drawing into darkness to create light I embarked on my first ‘silkscreen mezzotint’. I prepared a dark ground with a charcoal stick, ensuring a dense and even ground. Intenionally I ‘left’ some of the initial charcoal sweeping marks around the edges to retain this rough part of the process to be seen by the eventual viewer. Over 3 days I attempted to learn from drawing marks on the dark ground. After a quick outline of the image was made I worked from a large scale blow up of the small photograph and used the erasers to draw the image. I learned how the dark could be drawn out enabling highlights and textures to show through. I found that a range of textures were possible by applying various pressures and holding the eraser at different angles to the ground. Sharp lines could be made to reflect the subject’s highlights. The drawn lines in particular could be used to make marks that contributed to the overall portrait, but equally could be more abstract than figurative, creating more depth to the portrait, and perhaps enhanced enquiry from the viewer. I realised this was not my usual clean process of drawing with pencils or graphite sticks on clear film as I cleaned the build up of charcoal dust from my studio workspace and regularly washed my hands of the dark, dark dust. This is a tactile drawing experience. decisions. The image has changed. The materiality of the image is changed and the meaning of the image has changed from a document of reality to a bespoke artifact. A portrait. This changing meaning of the digital image through the methodology being applied will be the subject of a future ’I want to say chapter’. In this early gathering of thoughts and reflections on my research I have attempted to put down on paper through words, what stage my research in contemporary portraiture – through smart phone photography, drawing and printmaking – is, as I move forward on the three strands of work. They are fundamentally interrelated as I strive to create images of the people I have met and selected to make a portrait of to the best of my ability. This much I want to say. Although identical twins have identical genes, different life experiences mean they do not have identical brains. 6.The new Arab. Images and idols. The figurative in Islamic Art. Central Islamic lands at the museum of art in Doha. Ricardo Moraes. Photos for gaining trust to deliver positive medical interventions in Kayapo culture in Brazil. FACE Bruce Gilden photographs. Daniel Lewis publishing 2015.